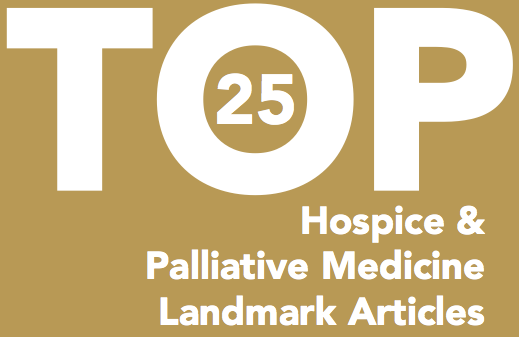 Back in 2015 we wrote a post asking for input on what articles should belong on a list of the top 25 articles in hospice and palliative care. We decided to focus on hospice palliative care studies and trials - as opposed to review articles, consensus statements and opinion pieces. Here’s what we came up with. It was hard to pick just 25! We highly prioritized clinical utility and tried to achieve diversity & balance. Many others are worthy of inclusion. Take a look and let us know if you have suggested changes for next year. Randomized, Double-Blind, Placebo-Controlled Trial of Oral Docusate in the Management of Constipation in Hospice Patients. Tarumi Y et al. JPSM, 2013. Once-Daily Opioids for Chronic Dyspnea: A Dose Increment and Pharmacovigilance Study. Currow DC et al. JPSM, 2011. Effect of palliative oxygen versus room air in relief of breathlessness in patients with refractory dyspnoea: a double-blind, randomised controlled trial. Abernethy AP et al. Lancet, 2010. Does Feeding Tube Insertion and Its Timing Improve Survival? Teno JM et al. JAGS, 2012. Parenteral Hydration in Patients With Advanced Cancer: A Multicenter, Double-Blind, Placebo-Controlled Randomized Trial. Bruera E et al. JCO, 2013. Effect of Duloxetine on Pain, Function, and Quality of Life Among Patients With Chemotherapy-Induced Painful Peripheral Neuropathy: A Randomized Clinical Trial. Lavoie Smith EM et al. JAMA, 2013. Randomized Double-Blind Trial of Sublingual Atropine vs. Placebo for the Management of Death Rattle. Heisler M. JPSM, 2013. Factors Considered Important at the End of Life by Patients, Family, Physicians, and Other Care Providers. Steinhauser KE et al. JAMA, 2000. A Controlled Trial to Improve Care for Seriously Ill Hospitalized Patients: The Study to Understand Prognoses and Preferences for Outcomes and Risks of Treatments (SUPPORT). The SUPPORT Principal Investigators. JAMA, 1995.
of Surrogate Decision Making before Death. Silveira MJ et al. NEJM, 2010. A Communication Strategy and Brochure for Relatives of Patients Dying in the ICU. Lautrette A et al. NEJM, 2007. Family Satisfaction with Family Conferences about End-of-life Care in the Intensive Care Unit: Increased Proportion of Family Speech is Associated with Increased Satisfaction. McDonagh JR et al. Crit Care Med, 2004.
at the End of Life. Balboni TA et al. JAMA Intern Med, 2013. Family Perspectives on End-of-life Care at Last Place of Care. Teno JM et al. JAMA, 2004. Extent and determinants of error in doctors’ prognoses in terminally ill patients: prospective cohort study. Christakis NA et al. BMJ, 2000. Trends in Survival after In-Hospital Cardiac Arrest. Girotra S et al. NEJM, 2012. Functional Status of Elderly Adults before and after Initiation of Dialysis. Tamura MK et al. NEJM, 2009. Patients’ Expectations about Effects of Chemotherapy for Advanced Cancer. Weeks JC et al. NEJM, 2012. “It’s not just what the doctor tells me:” Factors that influence surrogate decision-makers’ perceptions of prognosis. Boyd EA et al. Crit Care Med, 2010. Cost Savings Associated With US Hospital Palliative Care Consultation Programs. Morrison RS et al. Arch Intern Med, 2008. Hospice Enrollment Saves Money For Medicare And Improves Care Quality Across A Number Of Different Lengths-Of-Stay. Kelley AS et al. Health Affairs, 2013. Do Palliative Consultations Improve Patient Outcomes? Cassarett D et al. J Am Geriatr Soc, 2008. Change in End-of-Life Care for Medicare Beneficiaries: Site of Death, Place of Care, and Health Care Transitions in 2000, 2005, and 2009. Teno JM et al. JAMA, 2013. Early Palliative Care for Patients with Metastatic Non-Small-Cell Lung Cancer. Temel JS et al. NEJM, 2010. Early Palliative Care in Advanced Lung Cancer: A Qualitative Study. Yoong J. JAMA Intern Med, 2013. So what do you think we forgot? What studies do you most commonly think about, mention, and cite during your clinical work that's not on this list? Hammes BJ, Rooney BL. Death and end-of-life planning in one midwestern community. Arch Intern Med. 1998;158(4):383-90. 1) Wright AA, Zhang B, Ray A, Mack JW, Trice E, Balboni T, Mitchell SL, Jackson VA, Block SD, Maciejewski PK, Prigerson HG. Associations between end-of-life discussions, patient mental health, medical care near death, and caregiver bereavement adjustment. JAMA 2008; 300:1665-73. 2) Wright AA, Keating NL, Ayanian JZ, Chrischilles EA, Kahn KL, Ritchie CS, Weeks JC, **Earle CC, **Landrum ME. Family perspectives on aggressive cancer care near the end of life. JAMA. 2016;315(3)284-92. I use #1 all the time in my teaching. The hard part will be to figure out what to take out! I love this! You could do it like the bill of rights and just keep adding amendments! Anyone else disappointed with "real life" results of duloxetine in CIPN? I work in outpatient palliative oncology and the "successes" seem to be few and far betweeen. I find these two additional articles to be helpful in prognostication and in teaching. (Especially the Neuman article). Among Nursing Home Residents. JAMA Intern Med. 2014;174(8):1273-1280. Older Adults With Chronic Illness. CHEST.2014;146(5):1214-1225.